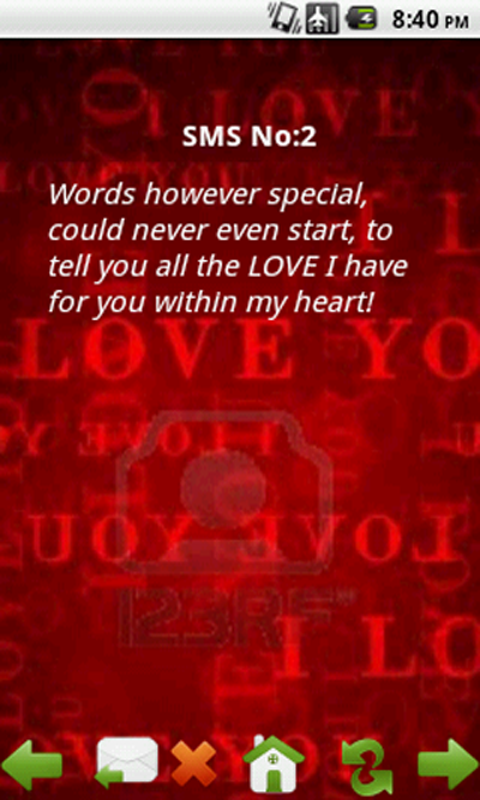 "Great Collection of Love SMS, Love SMS Messages, Romantic Love SMS Messages. True love is a sacred flame / That burns eternally, / And none can dim its special glow / Or change its destiny. / True love speaks in tender tones ... Send your eternal feelings through Love SMS and rekindle your romantic life. Love connects, surprise your partner with dynamic messages of affection and love. With scheduled sending and adjustable - frequency, level, confirmation request and others - be present. Like: I love you for the man you are, I love you for the things you do, I love you for the things you say. But most of all I love you because you love me for the woman I am for the things I do and for the things I say. I love you."